^ Mitchell, Stephens, "A Tentative Reconstruction of the Decatur Town Map of 1823", Atlanta Historical Bulletin, No.30, p.8, 1965. ^ Georgia Board of Education[リンク切れ], Retrieved June 8, 2010. 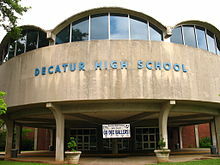 ^ "Schools and Centers Archived 2012年9月21日, at the Wayback Machine.." DeKalb County School District. Retrieved on September 18, 2012. "2652 Lawrenceville Highway Decatur, GA 30033"
^ "Library Locations & Hours[リンク切れ]." DeKalb County Public Library. Retrieved on February 24, 2010. ^ "Official Zoning Map[リンク切れ]." City of Avondale Estates. Retrieved on August 8, 2010. ^ "Post Office Location - DECATUR Archived 2010年7月27日, at the Wayback Machine.." United States Postal Service. Retrieved on August 8, 2010.